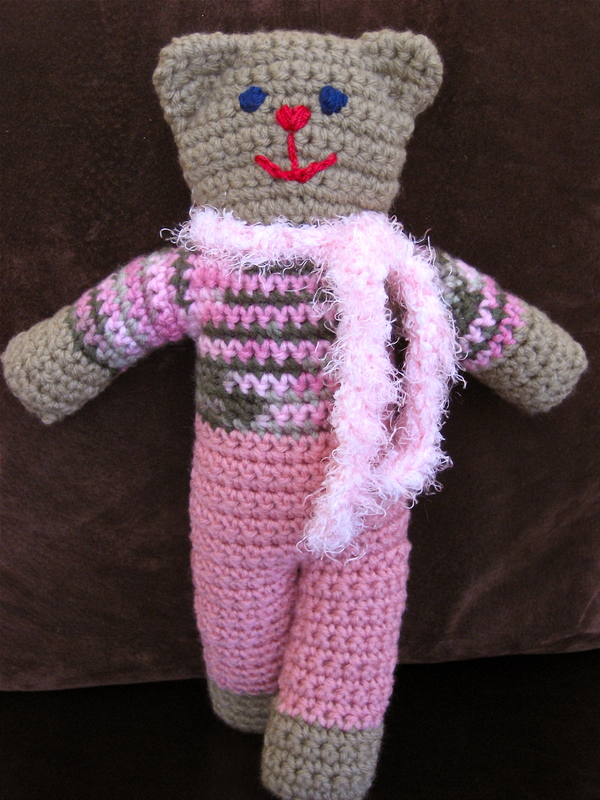 Here she is…at last…my very first contribution to the Mother Bear Project! I had visited their booth while attending Stitches East, back in November, and I purchased the kit to crochet an adorable bear that would be sent to comfort children who are affected by HIV/AIDS. You can read all about this very worthwhile project by visiting their site. All of the yarn (except for the scarf) was included in the kit, and I used size 3 crochet cotton to embroider the eyes, nose and mouth. I’m really looking forward to creating more bears to send off, and I’ve already gathered yarn from my stash to make another. Maybe this one will sport a sassy little purse or wear a sparkly, ruffled skirt and have a great, big bow on her head! Or…maybe he’ll be a dapper little dude with overalls, like Corduroy. If you’re a Ravelry member, you’ll find some great inspiration there…check out the huge variety of bears created by the oh-so many talented knitters and crocheters. I’ll be adding mine today! I’m so impressed! And remember you are welcome to my knitted bear kit…untouched by human hands. You are most generous with your time and talents. The kit is on the way. Can’t wait to see how you dress her up! Beautiful bear, Aunt Big A!! Thanks to you, that is one more smile on a child’s face. So cute! What a great cause! Congratulations on the webpage. It looks GREAT!!!! So glad you took the time to check us out. Hope all is well!